Weekly Meal Plan 20180317 | What's For Supper Tonight? We’re having Corned Beef tonight, to celebrate St. Patrick’s Day. There should be lots of leftovers, so we’ll use those in a Corned Beef Hash tomorrow night. 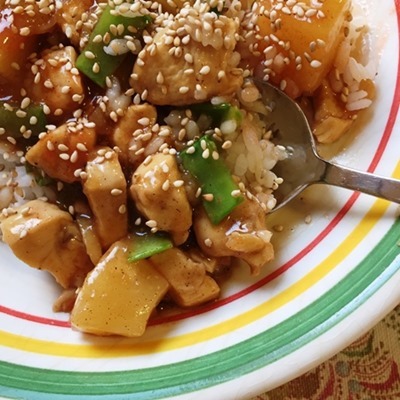 There’s one new recipe in the plan for this week – the Pineapple Ginger Chicken Stir Fry. It takes about 30 minutes to prepare, so I hope we decide to try it, and it turns out well. Then, it’s old favourites for the rest of the week, while we wait for spring to arrive. I hope the days start getting warmer! Here is our plan for the week starting Sunday, Mar 18, 2018. There are links for some recipes, and others are made “freestyle”. Here’s what we actually had this week. We stuck to the plan for most of the week, but moved a couple of things around. The Pineapple-Ginger Chicken Stir-Fry was delicious (picture below), and we’ll definitely have that again. I added thinly sliced water chestnuts and snow peas, to give it a bit of crunch and a little colour. We topped it with soy sauce, sesame seeds, and hot sauce at the table. Keith found a prime rib on Friday, so we had that for supper, and will have that in our sandwiches tonight. He bought a loaf of Sunflower Flax Sourdough bread at Cobs bakery, so those sandwiches should taste amazing! Here’s our stir fry, ready to eat. It was delicious!